Unusual in the compact MPV class in its day for offering two sliding rear doors, the Mazda5 is an oft-overlooked alternative in the large family car marketplace. 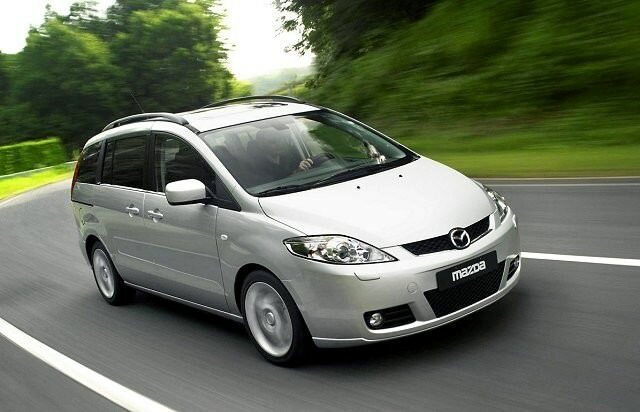 Unusual in the compact MPV class in its day for offering two sliding rear doors, the Mazda5 is an oft-overlooked alternative in the large family car marketplace. Typically dominated by the French brands the Mazda’s take on the compact MPV is a clever one, those sliding rear doors a real boon for those with child seats or small children. Only Ford’s Grand C-Max (available from 2010 onwards) offers similar, the Mazda beating it to showrooms by five years. Very useful thanks to its seven seats, it’s also sure to be reliable, making it a desirable used vehicle for those with larger families. Search the classifieds and with the exception of the very occasional 2.0-litre turbodiesel the majority of examples you can buy in Ireland are 1.8-litre petrol examples. The 1.8-litre unit delivers 115hp and allows a 0-100km/h time of 11.4 seconds. Not hugely quick, but the engine is smooth and relatively refined - more so after 2008 when a facelifted Mazda5 gained some additional sound insulation along with minor exterior and interior styling tweaks. Those 2008 changes might be welcome, but earlier cars have all the practicality of the later cars, the Mazda5’s interior a clever, useful space. The second row seats fold and slide, giving seating for three, while a pair of additional seats is stowed in the boot for further seating. With them stowed out of the way the Mazda5’s luggage space is vast, though obviously with them in use it’s less so; the 5 still offers reasonable luggage space. The dashboard is simple and clear, the high mounted gear lever making shifting a breeze - the standard transmission being a five-speed manual gearbox. Trim levels include standard and Executive, both decently specified, with Isofix child seat fixing, air conditioning, alloy wheels and a CD player/radio. Post-2008 cars were offered with additional extras like Bluetooth telephone connection and an aux-in jack in the dash for plugging in MP3 players, while improved navigation, powered sliding rear doors and a rear-view camera were also available as extras. Given the sheer number of 1.8 Executive models out there it’s the one to go for. The 1.8-litre petrol engine is smooth enough, and returns 7.6 litres/100km on the official combined cycle - and emits 182g/km of CO2. Post-2008 models are more refined and offer more standard equipment. Mazda’s 5 might be an unusual choice in the compact MPV marketplace, but it’s one of the bigger and more useful ones. Those sliding rear doors are a real selling point, giving excellent access to the second and third row seats. Good standard equipment and fine driving, it’s well worth considering if you need the space.